I should wash my hair before I die. That was the thought that ran through my head the other morning as I stepped into the shower. It was my second shower in 12 hours, and I was taking it purely because I wanted to die clean. In my head, I was making a list of all the things I needed to do before I died. I should wash my hair, shave my underarms, catch up the laundry, pay the last of the bills, order groceries… the list went on. Even having gone through this before, even with all of the research I’ve done, I missed the signs of postpartum depression until it was almost too late. I was literally planning how to make my death easier on my family because I genuinely thought they would be better off without me. I hadn’t got to the actual planning of my death, yet. The family always comes first, of course. It wasn’t until I said offhandedly that my husband didn’t care about me that he tuned into something being horribly wrong. I felt nothing but hopelessness and deep shame. Part of me still holds onto the fact that even though I was suicidal I have been perfectly normal over the last few weeks. Part of me insists that despite wanting to end my life, I’m completely fine otherwise. That morning, my husband and I sat on the bed and cried together as I poured my heart out. I felt completely worthless and out of control. I had little interest in the children, I hadn’t been sleeping well the last few weeks, at work I felt numb. Through it all, I wore a mask of happiness as I slowly cracked inside. The signs of postpartum depression are all there, though. They’ve been there for months probably. Nearly 10 months after giving birth, I’m irritable, highly reactive, gaining weight and dealing with symptoms like insomnia, lack of interest, wild mood swings, hopelessness, suicidal thoughts, and more. My husband is my rock right now. He made calls to my family, helped me take steps to get treatment, and doesn’t leave me alone. When all I want to do is isolate myself from the world, he is holding my hand and telling me it’ll be okay. Part of me wants to believe him, but I’m not quite ready to, yet. I still have those dark thoughts. I’m irritable and angry, and I feel like I’m going to cry every minute of the day. I’m exhausted, but I don’t sleep for more than 4-5 hours at a time. My head hurts constantly, and I’m still dehydrated from a stomach bug I had last week. Because I’m not eating or drinking enough. My ability to care for myself and make decisions comes and goes. It’s like being in and out of a fog. One minute, I can’t focus or keep a thought in my head, and the next I feel almost normal. I don’t trust it, and I don’t trust myself alone really. Not because I think I’ll harm myself, but because I don’t want to take a chance. And again, I’m surrounded by family support. I’m supervised and attempting to cope. Both a psychologist and an OB/GYN are treating me. I want to feel lucky about all of that—I know I’ll eventually get there. Right now, I just feel tired, and I want to give up. I’m trying to remember that’s okay. I’m trying to remember that I will get better. I feel alone even though I’m not. If you’re reading this and feeling alone, too, know that you’re not. You’re not alone, and there is help available. For those who are reading this as a mom wanting to know more about the signs of postpartum depression, a partner looking for information about it, or a mom potentially experiencing it. It’s important to note that not all women with have all of these symptoms. Postpartum depression presents differently for everyone, and only a doctor can diagnose it. It’s also very important to realize that women can also experience postpartum psychosis, which is rare but extremely dangerous and should be treated immediately. More about postpartum psychosis at Postpartum Support International. How is postpartum depression different from the baby blues? According to the National Institute of Mental Health, the baby blues affects something around 80% of new moms and typically in the first few weeks after birth. Moms with the baby blues feel sadness, tiredness, and worry. This is generally fairly mild and very much related to just how exhausting and overwhelming a new baby can be. Postpartum depression, on the other hand, is an extreme version of these symptoms and then some. Moms can be so consumed by sadness or anxiety that they find it hard or even impossible to adequately care for themselves or their babies. Untreated, this can last for months or even years. Unlike the baby blues, postpartum depression symptoms are severe and mostly require treatment. If you or someone you know are showing signs of postpartum depression, I’d encourage you to call a doctor or the National Suicide Prevention Lifeline at 1-800-273-TALK (1-800-273-8255); TTY: 1-800-799-4TTY (4889). A family doctor, OB/GYN, or psychologist are all good choices. For emergency situations, please call 911 or visit your local ER. 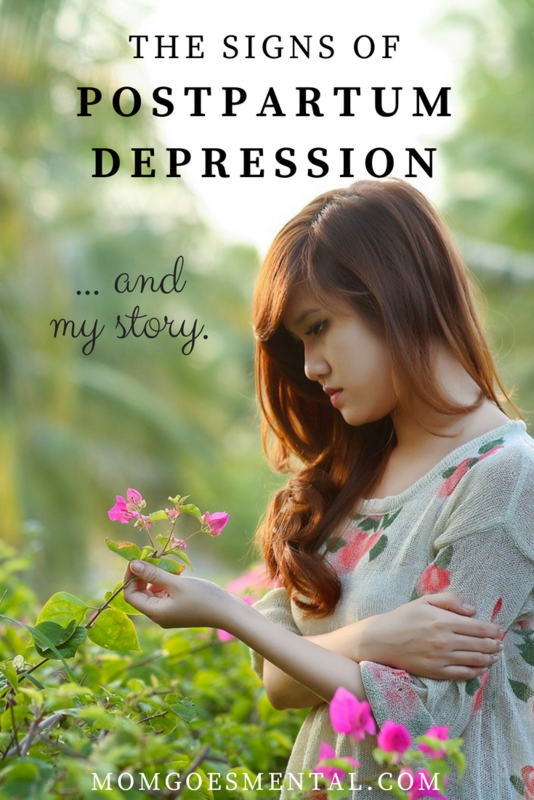 With treatment, postpartum depression is manageable and does go away eventually. It’s important to know that while symptoms generally start close to when your baby is born, there are those that experience postpartum depression for months or even years. It is so important to know the signs of postpartum depression. Know them yourself and educate your support network of friends and family about them, as they will often be the first to see these symptoms.